Okay, I should be fair. This was actually a pretty darn good book for what it is, and even though I'm about to point out its weaknesses, it overall gets a thumbs-up from me. Zombie Baseball Beatdown by Paolo Bacigalupi is a grody, funny adventure story of the classic "groups of kids running around with curiously little parental supervision" sub-genre. It's a buddy story, written in an accessible style, with plenty of the stuff that middle school boys like: slapstick, comic books, sports, video games, cars, oblivious adults, crazy heroics, poop. You know: the good stuff. I found myself smiling, compulsively turning pages, reading choice bits aloud, and rooting for the good guys. It was a fun read. On the other hand, Zombie Baseball Beatdown is also a not-at-all veiled polemic against racism, the meat industry, American immigration policy, and big business. As my husband, who is an expert in such things, reminds me, zombies are always political metaphors. And of course, subtlety isn't really in order when you're writing middle grade literature. That said, ZBB really lays it on thick. My personal politics weren't offended by the book, but it didn't take much imagination to realize that plenty of readers would be completely turned off by the story's message and end up walking away from what was otherwise a fun story. Obviously the use of fiction to promulgate ideology is nothing new (hello, pretty much everything you ever had to read for a high school English class) but a lighter hand with the vituperation might not have been uncalled-for here. As an adult reader of a kid's book, I was slightly uncomfortable with the violent ideation. It bothered me that almost all of the protagonists' (adult) nemeses conveniently got zombified, providing the kids with ample excuse to beat them up with baseball bats. I mean, I'm not so far gone that I can't see how this would appeal to a middle schooler's sense of justice; heck, some of these adults were so rotten before become zombies that I wanted to smack them myself. But there are a few violent (for a middle grade novel) moments where the kids get to deliver what ought to have been fatal beatings to adults in their lives, and they left me feeling a little disturbed. The inevitable zombie apocalypse scene blithely glosses over the fact that the kids are bludgeoning their erstwhile parents and neighbors. Looking back on the novel, I realize that there are really no positive adults in this book, and ZBB fails the Bechdel Test big time. I'm not really counting that as a flaw here; it's clearly a book intended for young guys, and the characters are pretty awesome. Our main character is a smart (but not caricature-smart) Indian-American boy who isn't much of a baseball player but has a good head for stats. One of his friends is a courageous, big-hearted Mexican-American boy from a family of illegal immigrants, and the other is a Martin Riggs type with a rough home life. Together, the trio face enemies small, large, bovine, and undead. The ending is deliberately untidy, in such a way that felt exactly right to me and will frustrate the heck out of its target demographic. Ultimately, this is a book that I'll still sincerely recommend to kids who will either gloss over the politics or not mind them, and it'll have a prominent place in our Halloween book display next October. 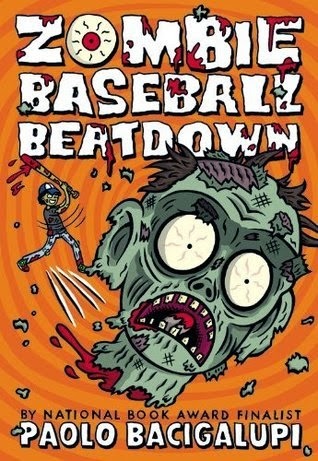 It may make Cory Doctorow's YA lit look subtle in comparison, but Zombie Baseball Beatdown is also a zombie-infested revenge fantasy filled with lots of cow poop -- what's not to love? I have relatives in Iowa, so this did really hit some of the big political issues out there! But, as you said, it also has zombies AND baseball. I am still concerned about what happens to the people in the town at the end of the book. There was never any real closure.